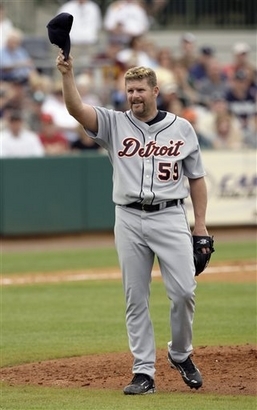 Todd Jones announced on Wednesday that he will be retiring at the end of the year. Even considering that I had assumed he was already retired, this kind of surprised me, since it seemed to me that Jones is exactly the sort of pitcher who would keep pitching forever, since he might be useful as a mop-up man throwing junk even after his fastball had deserted him. Jones always relied more on his sinker anyway. He doesn't need the gig, of course, having drawn over $37 million in salary in his 16-year career. He also writes for the Sporting News, and will apparently continue to do so, though as Rob Neyer points out, I'm not really sure why anyone would care, once he's no longer playing. Jones was drafted in the first round (27th overall) by the Houston Astros in 1989. That was a seriously talented first round draft, with eleven players who spent at least 8 seasons in the majors. Among them, Frank Thomas is easily the best, but Mo Vaughn won an MVP award, Charles Johnson was (for a while) an effective hitter with the best catcher's arm in the league, and Cal Eldred and Ben MacDonald were both dozen-game winners on several occasions. Also out of the later rounds of that draft (i.e. after Jones): Phil Nevin, Shane Reynolds, Denny Neagle, Ryan Klesko, J.T. Snow, and arguably the best player in LAnahfornia history, Tim Salmon. Oh, and futue Hall of Famers Jeff Bagwell, Jim Thome, Jeff Kent and Trevor Hoffman, though he was drafted as a shortstop. Talk about a deep draft. ...yep: 1.42 ERA at home, 4.91 on the road. But he stuck around for 15 more seasons, and didn't always have the inward-blowing air conditioning in the AstroDome to thank for his success. In 1996 he was swapped to Detroit in a 9-player trade, which wasn't all that unusual, since the father and son who served as General Managers of each team used to make a trade like that about once a week, or so it seemed. 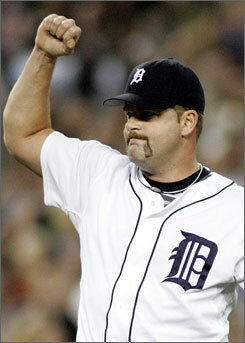 In Detroit he became the full-time closer and racked up about 30 saves a season for four and a half years. He led the AL in Saves and therefore won the Rolaids Relief Man of the Year award in Y2K, and was even an All-Star in 2000, finishing (brace yourself...) 5th in the AL Cy Young voting that year. Of course, that was the second straight year that Pedro Martinez won the award unanimously, so 5th place was a very distant 5th. The 3 points he amassed mean that Detroit's two beat writers probably put him on their ballots last and second to last, respectively. Still, 5th in the Cy Young voting! Woo hoo! Oh, wait, that's the Indians. Anyway, Jones was traded to Minnesota in 2001 for the stretch drive and became a setup man, a role in which he served for five different teams over the next three and a half years. In Florida in 2005, he again became a closer, saving 40 games with a 2.10 ERA for the Marlins, which could be argued to be his best season, though I would suggest that 1995 may deserve that honor. Yes, a slightly higher ERA, but he also pitched almost 100 innings of effective relief, and this in a strike-shortened year. With the closer tag firmly affixed to his back, Jones returned to the Tigers and racked up 75 saves over the 2006-07 seasons, plus another 18 this year before giving way to injuries. His ERA this year is an unimpressive 4.97, but in truth the 3.94 he put up in 2006 and the 4.26 he had last year weren't great either. The standard for a good relief pitcher is to post an ERA at least a run below the league average, and Jones was just a hair better than average each of those two years, as he frequently was. A typical season for him was 65 innings with an ERA around 4.00 and 30 saves. He'd walk just under a batter every other inning, with about a 2:1 K/W ratio. In other words, he was basically an average closer, but one who managed to stick around doing it for a decade and a half. Give him those three and a half years he speint setting someone else up and he's got 400+ saves, but then he wasn't very good in those seasons, so maybe that's asking too much. 1997: "He’s going to scuffle for a while." not likely to get any better." and increasing hit totals are not good trends." 2006: "Given his age, he`s a very shaky bet to repeat." skirts the edge and could implode any minute now." The irony here, of course, is that Jones managed to stick around for so long in spite of his inability to really impress anyone with his stuff. The truth is that you don't need to post a 1.39 ERA to be an effective closer, even though it's nice to look at those low numbers when folks like Mariano Rivera and Trevor Hoffman and Dennis Eckersly put them up. But really, if you're staked to a two or three-run lead, you can give up a run or two every time out, and as long as you get three outs before giving up three runs, you can make millions of dollars a year. Jones parlayed that modest skill into a 16-year career as a pitcher and a gig as a writer for the Sporting News, two things I'll likely never get to do. More power to him. In the end, he finishes with 319 saves, with an 81% success rate, an adjusted ERA 11% better than his leagues, and a 58-63 record.